Let’s have a serious talk about cloth napkins and mason jars. I know that folks may have tried to talk to you about this subject before. Wait. What’s that you say? No one has ever tried to have a serious talk with you about napkins and mason jars? Weeeeell…. It’s about time someone did. Let’s begin. We started thinking about how wasteful paper napkins seemed to be. We were only able to use them once and needed at least 9 napkins for our daily meals; and that wasn’t counting using any for snacks. It seemed to us that we were wasting money buying napkins over and over again. We were also wasting space in a landfill… It seemed that a simple solution would be to use cloth napkins and wash them with the regular laundry. At first, we looked into buying some cloth napkins. They were ridiculously expensive and ugly. Scratch plan A. Plan B was to make some napkins. Happily, it was around Christmas time when Plan B went into action. For one of our Christmas presents that year, my Mom and Grandma made us napkins! Turns out that napkins are extremely easy to make. If you want to make your own, simply cut a square of cloth the size you want your napkin to be. Hem the edges all the way around. Presto! You’ve got a lovely cloth napkin. It’s been five years since Mom and Grandma made us those first napkins. Guess what? We’re still using them and they’re just as good as new. Well, now that we’ve had a little napkin talk, let’s move on to mason jars. Our love affair with mason jars started when we began reading about the negative effects of plastic. There was more than enough research out there to convince us that plastic needed to have a limited role in our life. So, the little plastic containers got recycled and sold at a yard sale. Then, we were in a bit of a quandary. We used those little plastic containers a lot. What was going to replace them? Helloooooo masen jars! We already had lots of mason jars on hand since we canned almost all of our own food. These were our perfect solution! We have discovered that these jars are the handiest things ever! Mason jars are perfect for storing leftovers in the fridge. You can use them instead of plastic containers to carry food in your lunch box. You can freeze them (if they are can and freeze jars). They also make great water bottles for working on the farm or taking to work. Taking mason jars to work? Yes, I do. At first, I got some strange looks when I whipped out my cloth napkin and mason jar filled with iced tea at lunch. But, my co-workers are used to me being a little different, and after explaining why I had them, most people thought it was kind of neat. It really all depends on what you’re used to. When I told my little girl that some people only used paper napkins instead of cloth, she thought that was extremely bizarre! 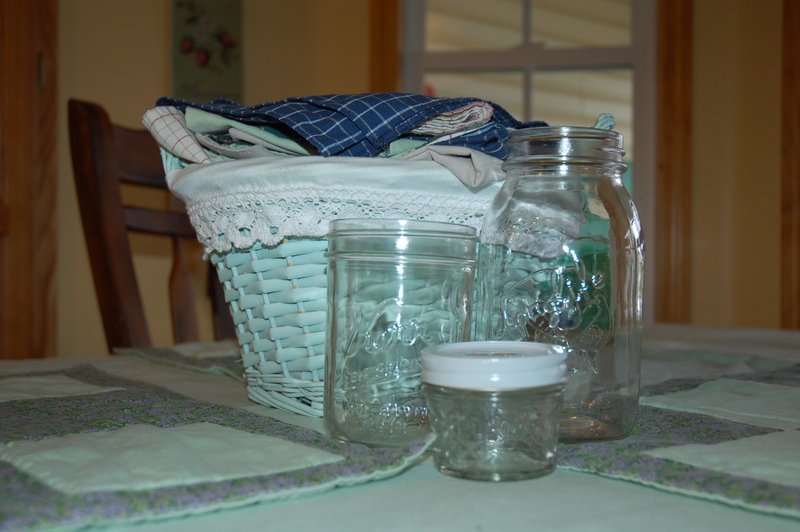 Cloth napkins and masen jars….simple items that can make serious changes! *Have you made any simple changes in your life like using cloth napkins? Let us know about your simple items that make serious changes by writing in the comments box below. A famous person once said that, “Some girls are just born with glitter in their veins”. I fully believe that this is true. I adore anything that sparkles, glitters, or shines. Gaudy is a word that doesn’t really exsist in my vocabulary. I am pretty sure that this love of sparkle is a genetic trait. I am certain that I acquired this love of glamour and glitz from my Grandma Mary. Grandma Mary and I were like two peas in a pod. As a tiny girl, I stayed with Grandma and Grandpa during the day while my parents worked. At that time, she was very sick, and was in the last stages of bone cancer. Grandma lived in a big rambling farmhouse that was well over 100 years old. She had a passion for antiques and all things vintage. Every day, I would ask Grandma if I could go look around in my favorite room in the house- her bedroom. She would always agree, as long as I solemnly promised not to touch anything. Grandma’s bedroom was breathtaking! There was so much to see that I could hardly take it in. Her low dresser top was covered with antique ladies fans, glittery costume jewelry, all sorts of hats, and pairs of white gloves. Other surfaces held her collection of antique dolls dressed in silks, satins, and bows. It was a little girl’s dream! Often, I would find one particular item that was especially interesting, such as trinket box or hand beaded purse. I would rush out to her hospital bed, describe what I had seen, and have her tell me all about it. 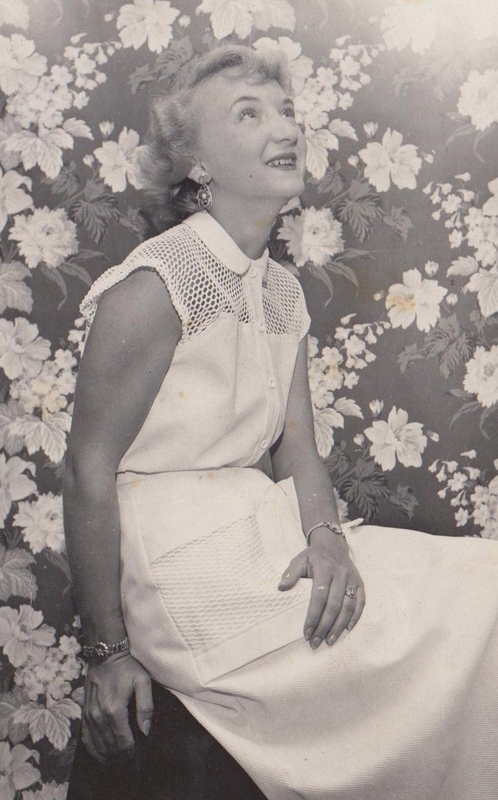 Even though Grandma had a devastating illness, she still did her best to be glamorous. I would help her paint her long fingernails her favorite, deep, crimson-red color. When her skin became dry and parched from her medication, her pink Oil of Olay face cream became a total body mositurizer. We found out it works espcially well on feet! On days that Grandma was strong enough to leave her bed, we would venture outside armed with her camera, hats, and other props for photo shoots, starring me! Looking back now, I realize that she knew her time was short, and she was trying to leave me memories of our time together in case my young mind let our adventures slip away. However, at four years old, I comprehended none of this, and just knew that I was the star of camera show. I really think this may help explain why I love speaking and performing in front of people today! Speaking of performing, that’s another thing that Grandma and I had in common. Just like her, I play the violin. One day, while I was listening to a piano and violin combination of the song, “Fur Elise”, I commented to my Dad that it was my favorite song. He looked at me in a funny way and said, “It was your Grandma’s favorite song to.”. Besides playing the violin, Grandma was also an accomplished pianist and artist. One of my favorite paintings that she did is of a Victorian lady who is wearing a fancy pink dress, and carrying a pink parasol. Everytime I look at it, I smile, and think of Grandma. Even her art was dramatic! When I was five, Grandma Mary went to a place where the streets are paved with gold. Jewels, gold, and pearls sparkle and shine all around. This place is called heaven. Even though I’m sure she feels right at home, I still miss Grandma something fierce. Her love reaches through the years and touches my heart. Just like Grandma, I believe that glitter and glitz can go anywhere. It’s not unusual for me to wear my pink pearls when I’m selling vegetables at the farmer’s market; to wear an antique 1960’s pill box hat that’s adorned with feathers to church, or to carry a vintage 1940’s beaded black handbag to work. After all, “some girls are born with glitter in their veins”, and for some, very special, exceptionally lucky ones, it’s inherited from their Grandma. Welcome to our new blog site! I think this site should be easier for folks to use. You can easily comment on posts and you can sign up to follow this blog on email. Enjoy! Do you ever find yourself hustling and bustling through life, hurrying to get one thing done so that you can rush on and do the next thing on the list? This happens to me more often than I’d like. Between helping Joey on the farm, teaching school, and a million and one other things that folks do, sometimes life seems to be running in fast forward. Sometimes, when this happens, I have to hit the pause button! I have to stop and “freeze frame” my life. When I freeze frame, I pause (just for a minute! ), and think to myself, “What is special about this season in my life? What is happening right now that probably will not happen in any other season? What will I want to remember about this time when I am very old and look back over my life?”. These questions never fail to stop me in my tracks. They bring my focus away from racing as fast as I can to finish a task, to slowing down and appreciating the finer details of the season that I’m in. I’ve freeze framed some pretty special times in my life. When my daughter was tiny, I tried to freeze frame the way her little warm body felt as she snuggled up against me during nighttime feedings. When we have to harvest vegetables for market in the pouring rain, I try and freeze frame how young and strong Joey looks with his hair soaking wet and water running down his face. I always wonder what he’ll look like when we’re old and gray. As I play music on the courthouse square, I freeze frame the sweet sounds of the guitar and fiddle as the music blends together and floats away in the cool night air. When a big crowd gathers round to listen, I try and freeze frame the smile on my Dad’s face and the way his eyes light up at the loud shouts and applause when we play, “Orange Blossom Special”. Just like the natural seasons, our personal seasons in life are all different and full of changes. Some seasons are slow and easy, some are painful and bittersweet, and other seasons seem to fly by in a blur. Don’t let your seasons slip away without stopping to notice how beautiful and special each one is. Once a season is gone, you can’t get it back. It’s okay to hit the pause button once in awhile. In fact, you should! Freeze frame a moment or two this week, and enjoy every day to it’s last drop! Relax for a moment and think about the good things in life! 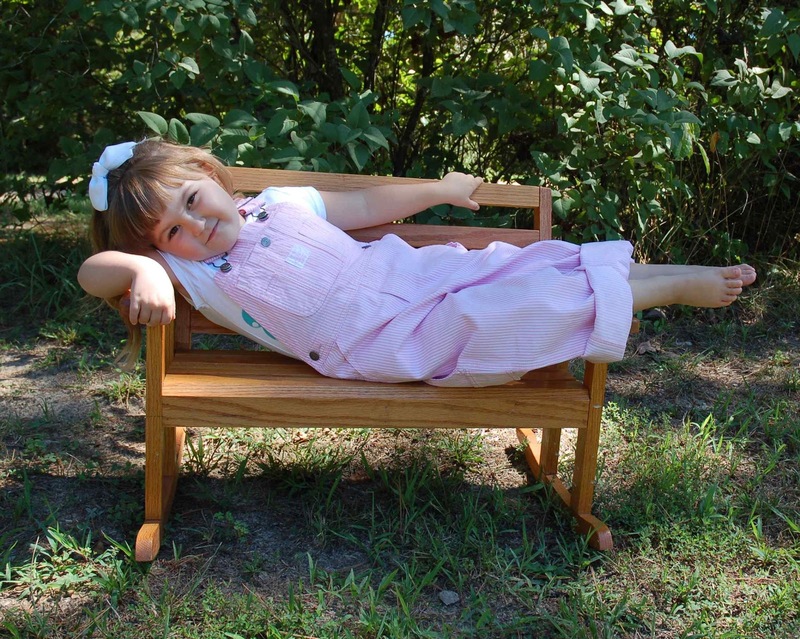 This is Elizabeth relaxing in the front yard last spring!